phpMyAdmin is the most popular tool used to administrate MySQL databases. You can run SQL queries and create, edit, drop, import / export MySQL databases using phpMyAdmin. In this tutorial you will find out how to export MySQL database using phpMyAdmin. You can find phpMyAdmin icon under Databases section in your hosting control panel. On the left side of phpMyAdmin you can see all your MySQL databases. Click on MySQL database you want to export. In our case we will export yourdoma_wp539 database. Press on Export tab which is located at the top of the page. Tables. Export only selected tables. Output. Change character set of the file, file name template and enable compression – MySQL backup file will be compressed. This is handy if your database is big as it will reduce the size of the file. Format-specific options. Different settings can be changed here depending on the selected format. For example, you can change columns separator when exporting database as CSV file. It is recomended to use Quick – display only the minimal options export method. phpMyAdmin will select optimal settings depending on your export format. Choose SQL format as it is default format used to import / export MySQL databases and is widely supported by different systems. Press GO button to begin export and start the download of your MySQL backup file. 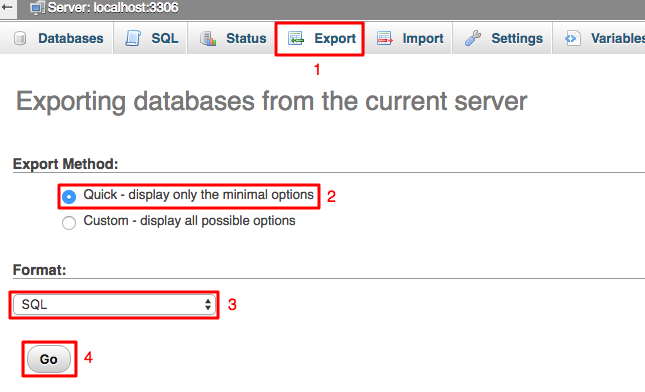 This short tutorial showed you how to export MySQL database using phpMyAdmin. It will help you if you want to migrate website between hosting accounts or simply backup your MySQL database. Tutorial showing how to import MySQL database can be found here.